A while back, after presenting one of our smartphone seminars, someone asked us if he could use his smartphone to record messages that he would send to his family and friends about his travels. He is an RV traveler and he wanted to share his experiences, but he really wasn’t into photography and didn’t want to keep a blog. I thought he meant that he wanted to dictate messages, like we show in our seminars. You can talk to your smartphone and it will transcribe your words. You can do this while composing an email message, saving you the trouble of typing. It does a pretty good job, but you still need to check for errors and fix them before clicking Send. Nope, that wasn’t what he meant! He wanted his family and friends to hear his voice. He wanted to tell of his adventures and have an audio file as a result. What a great idea! I remember when I was a little girl and my family traveled to Guatemala from Alaska. We took a reel to reel tape recorder with us and we each took turns recording our impressions of our travels. When a half-hour tape was full, we’d package it up and mail it off to my grandparents in Florida. I sure wish I knew where those tapes were now! That would be a find. Anyway, how to accomplish this? I tried it out using my note-taking app from Catch.com. Sure enough, I just tap the icon to create a new note, then instead of tapping on the pencil to create a written note, I just tap on the microphone icon to record a voice note. When I’m done, I can either share the Catch note with my friends, or, I can simply tap the Share icon and select email. The voice note is sent as an attachment to the email. The same thing can be done with Evernote. If you make the recordings with an App like Evernote, or Catch, they can all be gathered together in a folder for easy access at any time. Because both these apps are Cloud-based, it means that they are accessible on your computer as well as your phone and your tablet. You don’t even need to send it in an email, just share the Evernote folder with your family and friends. They’ll receive a link in an email, when they click on that link they’ll be able to listen to your recordings. Jim has been talking about doing a Podcast for years! (See this previous article to learn about podcasts) For a while there, we were making video recordings of the two of us talking about technology and travel. We called it Gabbing with the Geeks, and we put each video on a blog post on our website. Although we really liked it, we stopped after a while because it was just too much work. Oh … not the recording part. The getting dressed and putting on makeup part! It really is a lot more intimidating to sit yourself down in front of a camera instead of just a microphone. Then there was the editing, rendering, uploading and posting. We often listen to the podcast of our friends John and Kathy Huggins – Living the RV Dream. They record a full hour show every week! It’s a wonderful way to be entertained while you’re driving, and we know more and more RVers who are using their smartphones for downloading and listening to podcasts. Most new car radios have a way to either plugin your smartphone, or use Bluetooth so that the sound comes out the radio speakers. If not, you can also use inexpensive devices like the Jupiter Jack. We’ve been researching and testing to see if we could come up with a way to use our smartphones to record an audio version of Gabbing with the Geeks. If it could be done with our smartphones, that means we could record at any time that we thought of something to say! Like a candid photo, you could hear us in a more natural, unrehearsed mode. No pressure to set up a video recording session. And, if the recording software could pause and resume, then we could probably get away with no editing. Then we had to research the file format, a way to upload the file to a website, and a way to play the audio from our website. I’m sure we’ll keep researching and improving, but, we have come up with a way that is easy enough, and successful enough. Check it out. Here’s the recording we made just today, while on our morning walk! Jim talks about Windows 8 as we both breathe heavily and try to get some exercise! Just open the post and click the play button. We’ve found the results are best if you’re using the Chrome browser, but people have tested it in Safari and others and reported good results. We’ve also included a link to the .wav file itself so you can download it if the Play button doesn’t work on your device/browser. For those of you accustomed to subscribing to real podcasts, we don’t have that piece in place. Right now, it’s just an audio file that you can either listen to, or download, by going to the web page where it is posted. This also means that you can leave comments. Please do. Published by MrsGeek, in Blog. 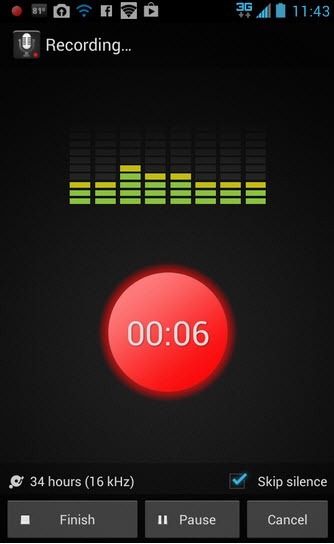 Tagged with podcasts, smartphone apps, voice recorder.